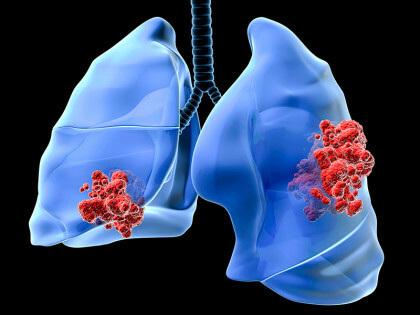 A huge study identified several new variants for lung cancer risk that will translate into improved understanding of the mechanisms involved in lung cancer risk. Their findings, “Large-scale association analysis identifies new lung cancer susceptibility loci and heterogeneity in genetic susceptibility across histological subtypes” will be published in an upcoming issue of Nature Genetics. “What is particularly exciting is the magnitude of the study along with the new findings of genes influencing lung cancer which have not previously been reported” said Amos. “This study definitely leads to new ideas about mechanisms influencing lung cancer risk. In particular we identified several novel variants influencing telomere function that impact risk for lung adenocarcinoma. In addition, we found variation around a subunit of the nicotinic receptor that affects lung cancer risk and smoking behavior and appears to have a primary effect in the cerebellum, which has rarely been implicated in affecting addictive behaviors.” Further studies will provide a better understanding of the role of target genes in influencing lung cancer risk, smoking behavior and smoking effects on brain biology.